Who can resist the smell of freshly baked bread? Whether you want to bake by hand or use a bread machine, if you are interested in bread making, then this is the site for you. We have bread making recipes (for both hand and machine baking), plus advice and information on the latest bread machines which will enable you to wake up to delicious freshly baked bread every morning with minimal effort. 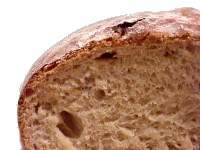 Did you know that store-bought loaves often have large amounts of salt and other additives in them? If you care about your own and your family's diet and health, you can use much smaller amounts of fat and salt by making your own bread, and just as importantly, it will taste much better too. Baking your own bread means that you know exactly what has gone into it. Have you read the label on a shop-bought loaf recently? You may find, among other things, "Mono and Diacetyltartaric Acid Esters of Mono and Diglycerides of Fatty Acids". What are they? I don't know, but I do know that when I'm bread making, I don't use any ingredients which I can't spell! If you have children who are fussy eaters, you can improve their diet by disguising other ingredients in your loaves. For example, you can gradually add more and more whole-wheat flour to their favourite white loaf without them even noticing, or you could use tomato juice instead of water when making your own pizza dough. If you have family members with special dietary needs such as gluten or dairy free, then making your own bread could make your life much easier. No more scouring grocery store shelves and squinting at labels trying to work out what's in the loaf. You can choose your own high-quality ingredients for your bread making. There are so many different types of loaf to try, including those with delicious added ingredients such as fruit and seeds, that you will never get bored with bread. Anyway, dip in and explore my bread making site...hopefully it will inspire you to have a go! If you enjoy healthy food and would like to find out more about where it comes from, why not try an olive picking holiday? You get to spend some time each day picking olives, with time to explore the surrounding countryside too.